In 1792, Montgomery and Pool, together with 13 other parishes, were incorporated under a local Act of Parliament (32 Geo.3. c.96. For the better Relief and Employment of the Poor, belonging to the Parishes of Montgomery and Pool, and certain other Parishes and Places therein mentioned in the Counties of Montgomery and Salop ). 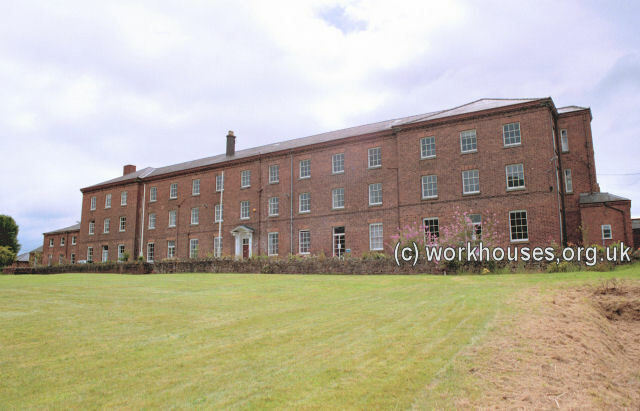 The Incoporation was governed by a board of 24 directors who had powers to manage poor relief administration and to set up a workhouse or "House of Industry". 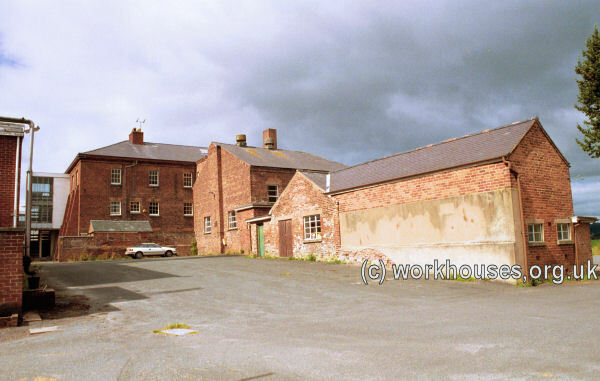 A workhouse was built in 1795, on an elevated site about a mile to the south-west of Forden. Designed by Joseph Bromfield, it cost £12,000 and could accommodate up to 1,000 inmates. In 1795, a schoolmaster was appointed at a salary of £10-10s-0d per annum, which presumably included board and lodging. In 1798 his salary was £14 per annum, but from the Board Minutes of 1804 it appears that this ill-paid functionary was allowed to earn an extra four guineas a year by cutting the children's hair, and shaving the poor inmates of the House. 4th Jan 1797 Mary Preynald for embezzling bread, cheese, beef and candles, to be publicly whipped in the hall before dinner next Wednesday. A frame for whipping persons is to be immediately made on the plan of that at the House of Correction at Montgomery. 8th Feb. 1797 Elizabeth Jones to be flogged "the 1st Board Day after Mr Baxter reports her fit for the operation, for absenting the house without leave" 9th Aug. 1797 Clerk reports opinion of full meeting of Directors that the Porter from the repugnancy which he hath to the executing corporal punishments, tho in other respects a good servant should be permitted to employ J. Davies on Monty, or another proper person to do that part of his duty. 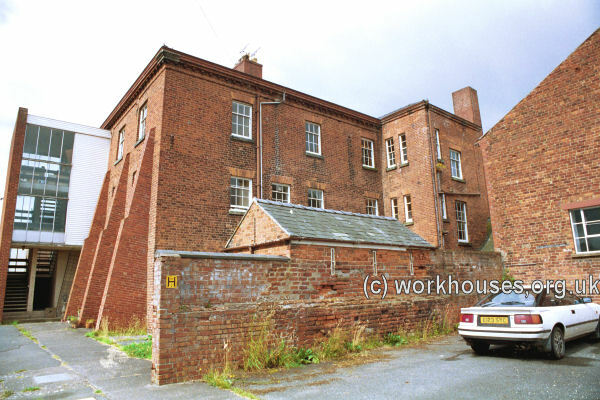 9th Aug. 1797 That the shoemaker's old room next the stairs be turned into a prison and that two cells of brick be built in the upper end thereof for close and solitary confinement. 19th Aug. 1801 Thomas Luke to be punished by whipping for robbing Mrs Edwards's orchard. 2nd Sep 1801 Elizth. Williams to be punished by a whipping for embezzling wearing apparel and other misconduct in the house. 2nd Dec. 1801 Maria Clayton having been detected in embezzling potatoes, ordered that she be punished by whipping. 12th May. 1802 Anne Davies to be placed in stocks with scolding bridle for 2 hours at dinner time to-morrow, and Mary Nicholas in stocks, same time for disorderly behaviour. 5th Oct. 1808 That a bridle for the punishment of scolds be purchased that lately in the house belonging to Montgomery Corporation being sent for back and returned. 4th Sept. 1811 That Joseph Heath, who deserted the house on 4th July last, be flogged on Wednesday next immediately before dinner, and to be put and kept in the stocks during dinner. 6th Nov. 1811 William Howells who deserted this house on 15th Nov. 1810, is ordered to be flogged this day week at dinner time. 21st Sept. 1814 John Jones having been guilty of great misconduct in prevarication relating to some money he has at interest with Mr Samuel Lea of Welbach, is ordered that he be confined in the crib till dinner time next Wednesday, and that then he be flogged unless he tells the truth. Because of its local Act status, the Montgomery and Pool Incorporation was exempt from most of the provisions of the 1834 Poor Law Amendment Act. It member parishes at this time were: Aston, Berriew, Brompton and Rhiston, Castlewright, Chirbury, Churchstoke, Cletterwood, Forden, Hope, Leighton, Llandysil, Llanmerewig, Montgomery, Lower Pool, Middle Pool, Upper Pool, Trelystan, and Worthin. Aston, Berriew (3), Brompton and Rhiston, Castle Caereinion, Castlewright, Chirbury (2), Churchstoke (2), Cletterwood, Cyfronydd, Forden, Hope, Leighton, Llandysil, Llanmerewig, Middletown, Montgomery (2), Lower Pool (2), Middle Pool (3), Upper Pool, Rhosgoch, Trewern, Trelystan, Uppington, Worthin. The parishes ranged in size from Rhosgoch (population 48) to Worthin (3,150). Later additions to the Union included Allerbury, Buttington and Guilsfield. The layoutof the site is shown on the 1901 map below. The main building was in the form of a U-shaped block facing to the north-west. Forden general view from the north-west, 2000. A small mortuary stood immediately to the north of the main building. Forden north wing and mortuary, 2000. Several outbuildings stood at the north of the site, one of which had its own partitioned yards at the rear. Forden northern outbuildings from the west, 2000. A chapel lay at the south of the workhouse. Forden rear view from the south-east, 2000. 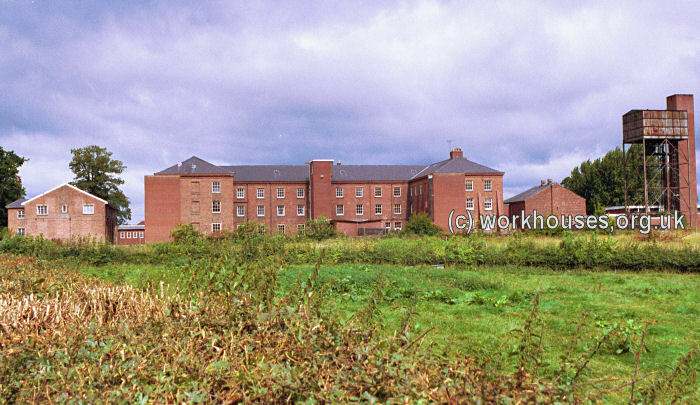 The workhouse later became Brynhyfryd Hospital and provided care mainly for the elderly. In 2001, the building was being used as a meditation centre. Powys County Archives Office, County Hall, Llandrindod Wells, Powys, LD1 5LG. Holdings include: Minute books (1795-1824); Minute book of Special Committee of Guardians (1818-25); Officer's Reports book (records information on many aspects of the workhouse, 1795-98) [digitised]; Cash book, receipts and disbursements (1800-03); Workhouse Master's Day Book (daily inmate statistics 1835-54); Guardians' minute books (1870-1900, 1912-15, 1921-30); Ledgers (1886-1930); etc.